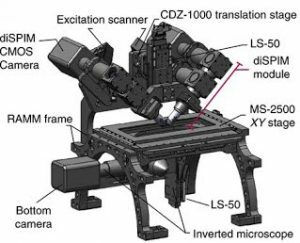 The dual-view inverted selective plane illumination microscope (diSPIM) is a light-sheet implementation optimized for imaging small specimens like elegans embryos. diSPIM enables sustained volumetric imaging at rates 10–1,000X faster than other 4D microscopes and at isotropic resolution (Wu et al., 2011; Wu et al., 2013b). diSPIM allows continuous imaging of the nematode embryo, scanning volumes every 2 seconds for the entire 14 hours of embryogenesis with no detectable phototoxicity. As such it provides unprecedented access to neurodevelopmental dynamics during neurulation. Although developed to address a specific biological question of interest to WormGUIDES, the system can be used for cell biological, developmental or neurobiological questions that require imaging of fast, dynamics events with limited photon budgets and at isotropic resolution.